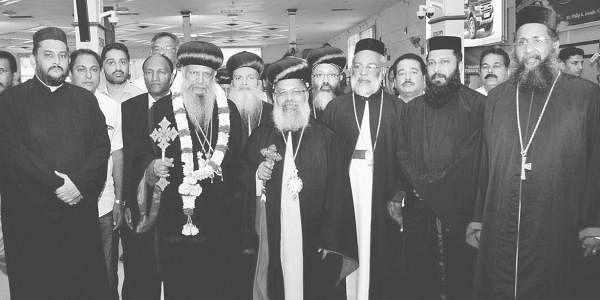 KOCHI: Patriarch Abune Mathias, head of the Ethiopian Orthodox Church, arrived in Kerala on Saturday on a one-week visit. The Patriarch was accorded a warm welcome at the Nedumbassery airport. During the visit, the prelate will be taking part in a host of programmes organised by the Malankara Orthodox Syrian Church. This is his first visit to Kerala after being anointed as head of the Ethiopian Orthodox Church. His itinerary includes celebrating Holy Mass at Arthat St Mary’s Cathedral on Sunday, along with Malankara Orthodox Syrian Church head Baselios Marthoma Paulose-II. Later, the Patriarch will attend the valedictory function of the bicentennial commemoration programme of Pulikottil Joseph Mar Dionysius at Adupputty Mar Dionysius Nagar, at 4.30 pm. On Tuesday, the Patriarch will lead the blessing ceremony of the centenary celebrations of Kuzhimattom St George Orthodox Church Sunday School. Later, he will inaugurate Snehasparsham, a scheme launched to support cancer patients, as the part of the 70th birthday celebrations of the Malankara Catholicos at Kottayam Mammen Mappila Hall at 5 pm. On Wednesday, the Patriarch will inaugurate the St Gregorios International Cancer Care Centre at Parumala.